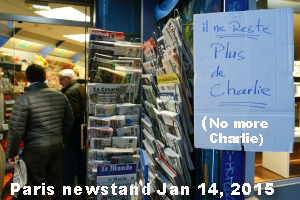 CHARLIE HEBDO’S BLOOD MONEY: PROFITING FROM MURDERS, TERRORISM – TRUTH IN MEDIA: TRUTH TRUMPS POWER EVERY TIME! Am I the only one who feels offended by the above news item? Nobody else smelling a rat here? A large rat! A New World Order-size rat. I’ve just searched the web and I can’t find anyone else’s comment that expresses outrage at such a blatant example of profiting from murder and terrorism. Which more than any other conspiracy theory I have seen in the last severn days about who was really behind the Charlie Hebdo attack points a finger at the New World Order elite. That, plus the Sunday march in Paris at which over 40 of New World Oder leaders jockeyed for a photo-op position in the front row. Because it took a massive amount of capital and PR skills pull off a show like the Sunday rally in Paris. And preparation. This had to have been planned for a long time. Everything was carefully organized. Buses for dignitaries, large crowds. Like a Hollywood production… (remember “Wag the Dog” movie?). What do you think the chances are that so many heads of state would clear their calendars and fly to Paris on a spur of a moment? Slim to none, right? It was clearly a command performance. Guess Obama didn’t get the memo. Or somebody at the White House screwed up. The subsequent White House remorseful explanation for Obama’s absence from the Paris rally suggests the latter. One week ago, the editorial office of an obscure French rag that had published offensive cartoons of Prophet Muhammad was turned into a blood bath. Twelve people were killed, including two policemen. Now, just seven days later, this fledgeling magazine that no one had heard of before last Wednesday is raking it in. As if getting a license to print money, Charlie Hebdo is over 80 times its normal circulation in an effort to profit from the sudden world fame. Wait a minute… Where did the money come from? Whose printing presses are able to handle a circulation bump 83 times bigger than normal? Who is masterminding this obviously globally orchestrated media frenzy? If you are prepared to accept that it is the surviving employees of Charlie Hebdo, then maybe you also believe in Santa Claus. Because it takes mega-bucks and a mega-size PR effort to pull off something like that. My bet is that it is the same people who staged the Sunday Paris rally. 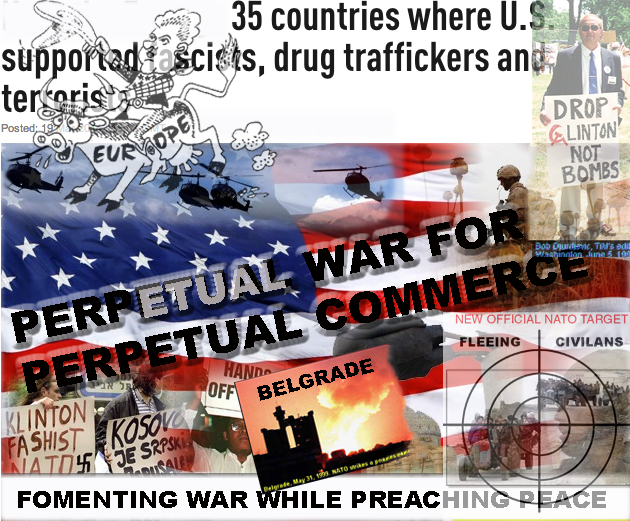 They are exploiting a human tragedy to make money and to advance the New World Order agenda. That fits the profile to a tee. “The magazine’s circulation has dropped over the years. While issues with covers depicting Muhammad sold about 100,000 copies, the magazine often printed 60,000 copies and sales sometimes didn’t exceed 30,000. Nothing like a (false flag?) terrorist attack to boost the circulation, huh? (also see the Turkish President’s remarks about who was really behind the attack). This is the first major country statesman to say publicly what so many of independent commentators and analysts have been saying, including the Truth in Media. behind Charlie Hebdo attacks and deliberately ‘blaming Muslims’ as conspiracy theories sweep the Internet accusing Israel of orchestrating it. WHO WILL WEEP AND MARCH FOR THESE MUSLIM VICTIMS OF FRENCH POLICE? In the aftermath of the Jan 7 attack on the Charlie Hebdo editorial office in Paris, the world witnessed one of the best orchestrated anti-Muslim marketing campaigns. Over 40 statesmen participated in the “March of Hypocrites,” including the Israeli prime minister Netanyahu. 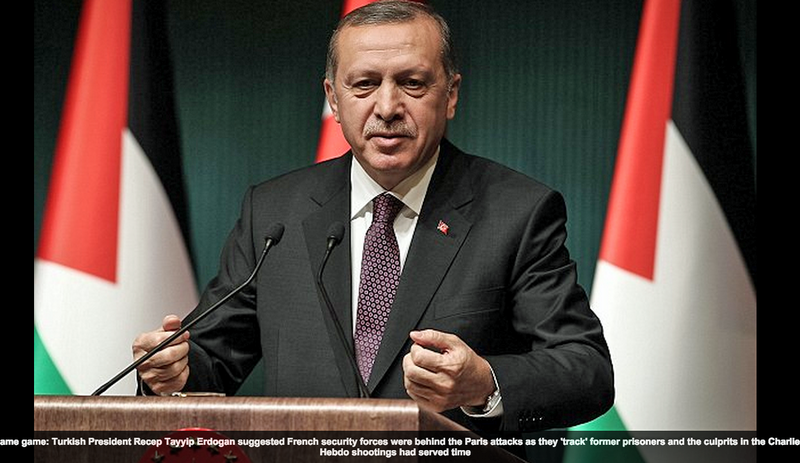 Afterward, TURKISH PRESIDENT ERDOGAN SLAMMED THE WEST AND ISRAELI PM OVER CHARLIE HEBDO ATTACK. Yet 55 years ago, another event took place in Paris that neither the French nor the world media bothered to cover. No marches. No world outrage. 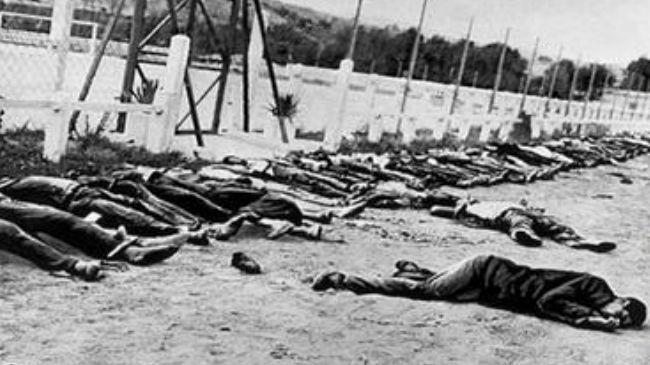 It was a massacre of dozens of Algerians. 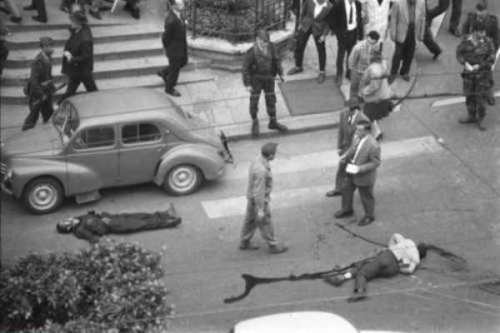 They were brutally murdered by the French police on Oct 17, 1961 in full view of the public, right in the streets of Paris. After 37 years of denial, in 1998, the French government acknowledged 40 deaths, although there are estimates of over 200 (see Paris Massacre of 1961). Unarmed Algerian Muslims demonstrating in central Paris against a discriminatory curfew were beaten, shot, garroted and even drowned by police and special troops. 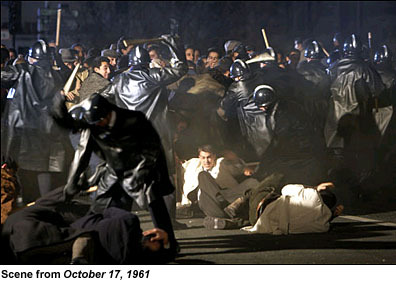 Thousands were rounded up and taken to detention centers around the city and the prefecture of police, where there were more beatings and killings. So who were the terrorists in Paris on Oct 17, 1961? The unarmed Algerians or the French police? Who will weep and march for these victims of state terrorism? Shutting down the freedom of speech while promoting it also fits the profile. (Also check out what the New World Order is about in New World Order’s War on American Family, Jan 2 and the excerpt from it – NEW WORLD ORDER CREED – below). By contrast. 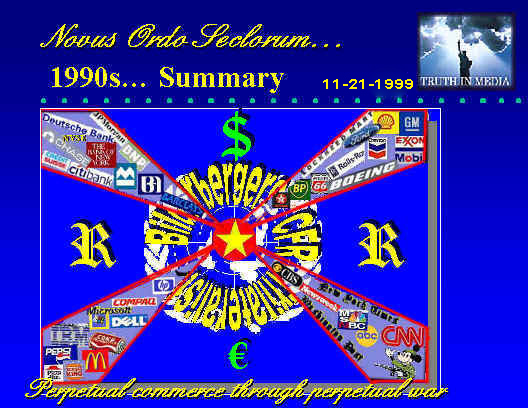 here’s what the Truth in Media said in November 1999 about the true meaning of the current New World Order. 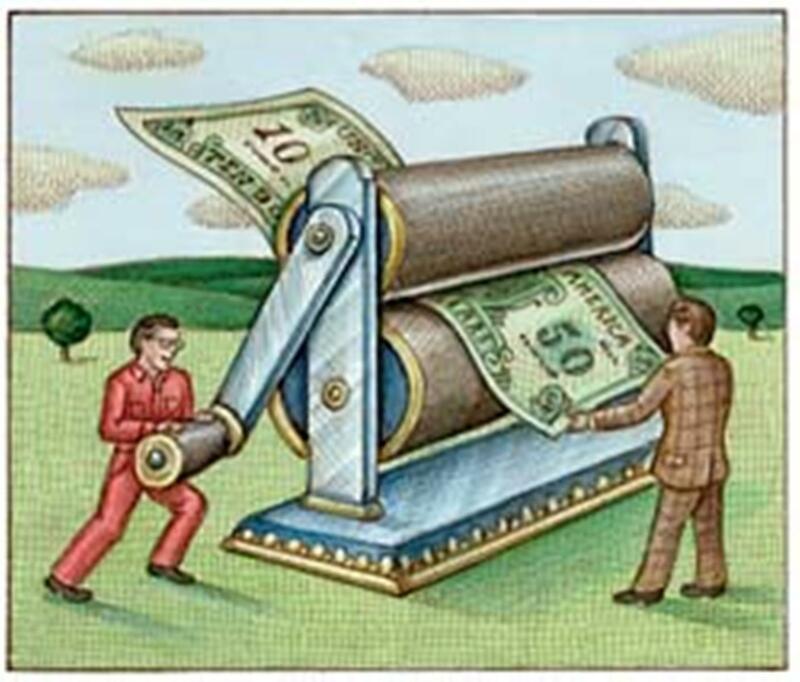 Its symbol: The Almighty Dollar. Or the Euro. Or… whatever other currency is in vogue. Its object of worship: The Golden Calf. Its holy shrine: Wall Street. You know the money from this edition is going to the victims families right? Okay. Thanks. Let’s hope that Sky News has got it right. That would be a proper way to dispense the profits. There is no question, however, that Charlie Hebdo had already received large subsidies from multiple New World Order sources even before this issue. They includes the French government – see that Bloomberg News story, for example.